When the season began, first-year head coach Jimmy Delevante told his team that the goal this season was to win a Suffolk County title. That early-season prediction would turn to reality as the Cougars captured its first Section XI title since 2009, beating defending champions Half Hollow Hills East 4-2 on Saturday afternoon at William Floyd High School in Mastic Beach. The runner-ups in the doubles final of the Suffolk County Individual Championships, Ryan Schoenfeld and Alec Sydney, delivered a 6-4, 6-0 victory at first doubles to earn Commack a doubles point. 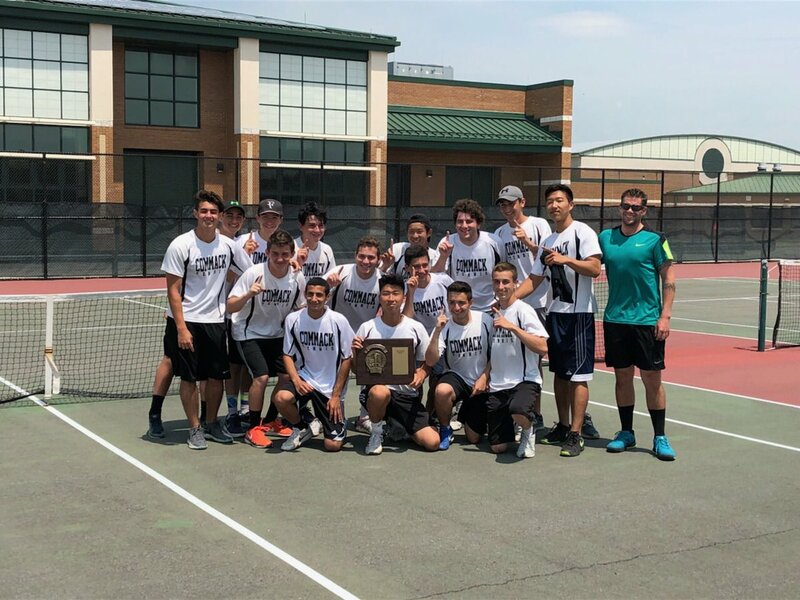 Commack’s singles play then did its part by winning at second, third and fourth singles. Senior Andrew Lin won 6-1, 6-4 against Ethan Ertel at second singles, Jake Stadok notched a 6-1, 6-2 victory over Ishan Varma, and eighth-grader Matt Strogach clinched the overall team victory with a 3-6, 6-4, 6-4 comeback win at fourth singles. “It was awesome,” Delevante said of the moment when his team clinched. “It’s one of those moments when you have a chance to win, but it’s not over until that final point. When the moment happens, you are almost unsure if it’s real or not. All of the hard work you put in throughout the season, and all the rain and weather stuff we had to deal with. It was just an awesome feeling when it finally happened, and it took a minute to settle in. Commack now prepares to take on Nassau County Champions Syosset in the Long Island championship, scheduled for Monday, June 4.